TV Week did an in-depth profile of Terry Wood, "the woman responsible for launching King World's 'Rachael Ray' this fall . . . ." As the President of Creative Affairs and Development for King World and CBS Paramount Domestic Television, she oversees Dr. Phil, The Insider (an ET spin off), and Rachael Ray. "What she brings to the table is experience and credibility," Mr. Carroll said. "The fact that she's supervising the Rachael Ray project really was one of the reasons it had such overall acceptance, because it was someone who has a recent and past history of success." As you could probably tell already, the introduction of Rachael Ray to the world through the Oprah show is a strategic move that worked for Dr. Phil. Rachael's appearances on Oprah also served as an interview of sorts, showing TV stations how Rachael would perform in her own show, which in turns helps to sell her show. "Yes, they knew her from the Food Network; they've seen her on 'Oprah,' but the idea of being able to spend five days a week with her was appealing to the viewer and the stations," Ms. Wood said. Station executives have responded to Ms. Ray. Multiple stations bid on the project in numerous markets. In January King World closed its booth at the National Association of Television Program Executives convention in Las Vegas early. The company posted a sign saying its new project was sold out. "Terry did not ask me to come to work and be something I'm not," Ms. Ray said. "She asked me to do something that was doable to me." Ms. Ray, who was a sought-after personality for syndication, could have gone with any studio she wanted for her upcoming daytime show. "There really is a genuine sense of the safety net there that I didn't get from meeting other people," Ms. Ray said of Ms. Wood. Sounds pretty good don't you think? Hopefully her success will match that of Dr. Phil. Keep your fingers crossed. I went to your August 10 morning show, I really hope your show does will. But with the format I am not so sure. There were too many fill in segments and not enough audience participation. I do have some suggestions. I think you should have guests. I would have liked if Rachael had at least 10 minutes of socialize with the audience. During breaks she could have come to every two rows and spent a minute or two. Even a sign autograph picture of her for every member of the audience would have been nice. She seems very down to earth, but my daughter Nicole Dougherty was excited that when she showed a clip of when she went out east on Long Island she stopped at Nicole's Aunts cheese shop, When Nicole tried to express her excitement Rachael did not seem to want to acknowledge her. We are the people who made her a success and she did not seem to have any time for just simple interaction. 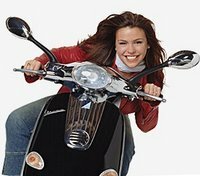 I love the Rachael Ray cooking shows, I just think this show needs a little more entertainment. Hi Kathy - I am not associated with Rachael Ray in any way and this is not an official Rachael Ray website. I suggest going to www.rachaelrayshow.com and submitting your comments there. Thanks for stopping by!